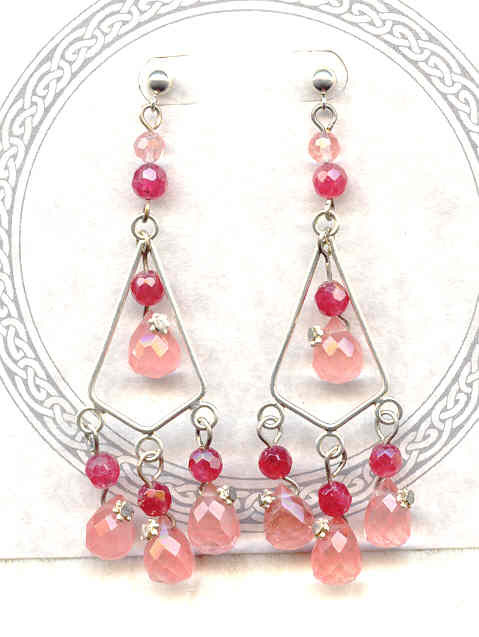 These colourful and unique earrings feature faceted cherry 'quartz' drops and faceted round ruby 'jade' beads, suspended from silver plate kite-shaped stations. So-called cherry quartz is not natural stone, but a glass product (not just mine; ALL cherry quartz is ersatz), and thus does not have the durability of stone. Ruby jade is dyed serpentine (but I've tested mine rigourously, and it will NOT fade or rub off). Imposters though they are, both are perfectly lovely, and so long as we're all perfectly clear on what they are -- and are not -- there's no reason not to enjoy them. Each earring dangles a hair more than 2-3/4 inches from the top of its sterling silver ball post finding. Cherry pink and raspberry beads may make you hungry, but these earrings are guaranteed low in calories and in carbs -- perfect for any diet. It's another versatile pair of earrings from SPARKLE PLENTY.